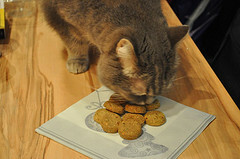 Homemade Cat Treats; recipes to spoil your kitty without spoiling his diet! This page is where the fun really starts: making homemade cat treats for your felines! 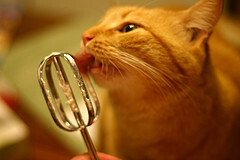 We all know that homemade goodies from Mom’s kitchen are the best, and our cats know it too! Let your cats know when you are cooking for him, and you’ll be surprised at how much they try to involve themselves in the process. It’s great fun to watch them as they supervise every step of preparation, to make sure we humans get it right! The recipes I have included below have not all been created by me, and some are the result of reader’s Meow Mail, and have been credited to the cat-chefs who sent them to me. Thank you so much for your contributions to this page, I couldn’t have done it without you! As with anything you plan to feed your feline, please review all the ingredients to be sure your cat has no sensitivity to them, and feel free to make substitutions on which meat to use, etc. I hope you and your kitty love these recipes for yummy, homemade cat treats. Your cat will enjoy them. You’ll feel good about the quality ingredients in your homemade cat treats. 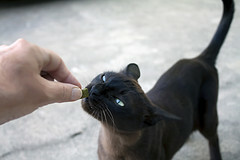 And both you and your cat can be satisfied that each of those treats was made with the secret ingredient – Love. Combine all ingredients and crush by hand or with a potato masher to form a firm dough. Take bits about a half teaspoon big and roll the mixture into small balls. Put balls on a greased flat baking pan or cookie sheet and flatten the balls slightly with hand. Bake at 250 degrees (F) for 15-20 minutes. Keep checking these frequently. Cook only until the Fish Yummies are a nice golden brown color and feel firm to the touch. Cool thoroughly and store in airtight container in fridge. Combine tuna, water and veggies. Stir in the cornmeal, flour and catnip. Mix well until it makes a dough. Knead several times and roll out to 1/4 inch thickness. Cut into squares or use small cookie cutters to create decorative shapes. Place shapes onto greased cookie sheet and bake in a pre-heated 350 degree (F) oven for 20 minutes. Makes approximately 1 dozen tasty homemade cat treats. Preheat oven to 350 degrees (F). Completely mix all ingredients in a large bowl until the dough is smooth and consistent. Then knead it with your hands to be sure all ingredients are completely blended. The dough should be soft, but not sticky. If stickiness is persistent after kneading, coat the dough with a bit more flour and knead again. Use a floured rolling pin to roll the dough out (flour the surface first) to make a very thin sheet (1/4" or thinner). Using a pizza cutter or very sharp knife, cut the dough into thin strips. Then slice the strips into 3” long pieces. Lay out the dough pieces onto a greased baking sheet so that they don’t touch. Bake for 20 minutes or until most of the pieces are lightly toasted. Once they are golden and toasty, take them out of the oven and cool completely. Cat Lady’s Note: Be careful to keep an eye on these while cooking. Because of their thickness and shape, they tend to burn quite easily. They are a fantastic treat however, and well worth the effort to make them. These treats are high in fiber which is helpful for hairball prevention and elimination. Still, they are a tasty reward for any cat, just remember not to over feed. Preheat oven to 250 degrees F. Cool meat thoroughly, reserving some of the liquid for later, and allow to cool. Chop the meat and then grind it till it is the texture of fine hamburger. Combine the meat with the rest of the ingredients, adding the reserved cooking water as needed to make thick dough. Add the water sparingly. Your goal is a dough that is coarse and just barely wet enough to form into balls. Shape the dough into flattened balls or little fishy shapes with hands. Place them on greased baking sheet and bake for 3 hours. After 3 hours, just turn off the heat and let the crunchies cool in the oven. Let these homemade cat treats air dry for at least overnight and store in an airtight container, unrefrigerated for up to one month. Preheat oven to 350 degrees. Combine all ingredients and mix well. Form mixture into nickle sized cookies on a baking sheet sprayed with nonstick cooking spray. Bake the cat cookies for 6 minutes, or until light brown. Remove from oven promptly and allow to cool. 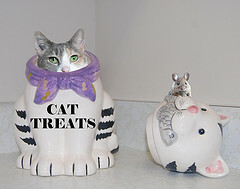 When completely cool, store your cat cookies in an airtight container in the refrigerator. These homemade cat treats look fabulous wrapped in the new colored plastic wrap and make terrific gifts for cats or cat lovers! Cut the turkey meat into very small cubes. Put meat and grated carrot into a saucepan and cover with water, (use more if needed). Bring to a boil, then reduce heat and simmer for 30 minutes or until the turkey is very tender. When meat mixture is done cooking, take 4 ounces of the liquid and put it in a measuring bowl. Stir the gelatin into the liquid until it's fully dissolved. Now take the turkey meat out of saucepan and combine it with remaining ingredients. Add this to the gelatin mixture. Adjust as needed to make 16 ounces total. Stir well to make sure the turkey and gelatin are evenly combined and pour in two containers. I like to use the inexpensive, square plastic ones with lids. Let this cool for about an hour and then put the lids on the containers and place in the fridge to set – at least 1 to 2 hrs. When ready, put a small amount into kitty’s dish and stand back! Let the feeding frenzy begin! To make these homemade cat treats, drain the tuna, and combine with the chicken. Add flour and enough lactose free milk to make a biscuit type dough. Roll into a long wormlike shape and cut into bite sized pieces. Bake for 5-10 minutes at 250 degrees (F), checking frequently. When light brown, they are done. Cool and serve. Directions: Put the fish in a large pot and cover with water. Bring the mixture to a boil, then reduce heat and simmer for 45 – 50 minutes. Take out any large bones that remain and pulverize the mixture with a whisk or potato masher.In a large saucepan, melt the butter or bacon grease and combine it with the flour. Gradually add the fish mixture to the flour and butter mixture, stirring constantly. Continue cooking for 5 to 10 minutes more, until the mixture thickens to the consistency of a regular gravy. Cat Lady Note: Unlike baked homemade cat treats, this gravy can be made as thick or thin as you or your cat prefer. My Spooky likes his gravy very thin, and so I don’t cook mine as long. You can freeze it in ice cube trays and store the cubes in plastic zippy bags. This gravy can be used for a variety of purposes, including getting a sick, elderly or finicky cat to eat, adding to dry kibble, feeding it alone as a snack or served over other meat. The smell is strong enough to hide most supplements or liquid medications, too! If you like you may substitute any lean meat of your choice, just cook it thoroughly and make sure it is ground fine enough for gravy.